We’d love your help. Let us know what’s wrong with this preview of The Future of Ideas by Lawrence Lessig. To ask other readers questions about The Future of Ideas, please sign up. After watching an interview of Lawrence Lessig back on the old TechTV channel, I was fascinated by his views on copyright and the public domain. I immediately researched him on the internet and walked down to my nearby Borders to pick up this book. This book became the basis that helped me define my views on the public domain and digital rights management (DRM). Every time I see large corporations use DRM as a way for content control rather than the protection of ideas, it makes me cringe and thi After watching an interview of Lawrence Lessig back on the old TechTV channel, I was fascinated by his views on copyright and the public domain. I immediately researched him on the internet and walked down to my nearby Borders to pick up this book. This book became the basis that helped me define my views on the public domain and digital rights management (DRM). Every time I see large corporations use DRM as a way for content control rather than the protection of ideas, it makes me cringe and think of this book. Because of copyright, do you think all of our music today is going to be passed from generation to generation like the public domain works of Mozart or Beethoven? Would we have amazing hip hop beats if there were no grey area of mixing music? After reading this book it might open up your mind and think about supporting the Creative Commons rights management. "The experts didn't get it", the book starts by giving you the history of the internet from the ground up, always reminding you that freedom drives innovation because the few at the top, might not get it. I didn't actually finish this book; I just cannot bring myself to finish it. What is it about the writing that makes it so infuriatingly slow-paced? It's just like The World is Flat. This book is a great exploration of a "third way" in governance alongside private markets and bureaucratic control. Lessig does for the Internet what Elinor Ostrom did for environmental resources in _Governing the Commons_: both draw attention to the overlooked possibility of decentralized institutions for governing common-pool resources. As an introduction to the politics and law of the Internet, I often wondered how current or out-of-date some of Lessig's technical and factual claims were. To t This book is a great exploration of a "third way" in governance alongside private markets and bureaucratic control. Lessig does for the Internet what Elinor Ostrom did for environmental resources in _Governing the Commons_: both draw attention to the overlooked possibility of decentralized institutions for governing common-pool resources. As an introduction to the politics and law of the Internet, I often wondered how current or out-of-date some of Lessig's technical and factual claims were. To that effect, this book probably works best as an introduction to the history of Internet politics rather than a primer on contemporary issues. After 15 years, the landscape of the Internets changed a lot and this book sometimes look outdated. But, it lays the basis for a reflection on what fostered innovation in this field, how intellectual property laws play a role and what changed when the Internets went commercial. This book is still worth reading and I would like to get a hand on an updated version, where the power of the gafa would be taken into account. A small and petty mind exposing its plan of Taking Over the World. A larger version of Brain from Pinky and the Brain. Okay. Things are going to be wonderful in that sort of Total Control. I get that. How about if someone else, even more petty and complex ridden than Lessig takes over this beautiful institution? Another mystery. I am a Lessig fan. That said, I think this was a very good book and would be a good read for anyone interested in intellectual property especially as related to technology. Two good issues discussed in the text were the idea of the commons verses ownership and the idea of regulation in advance. The first issue discussed the illusion that just because it is better to have some things as property (controlled by the market) it is better to have everything controlled as property. Thus, the illusion c I am a Lessig fan. That said, I think this was a very good book and would be a good read for anyone interested in intellectual property especially as related to technology. Two good issues discussed in the text were the idea of the commons verses ownership and the idea of regulation in advance. The first issue discussed the illusion that just because it is better to have some things as property (controlled by the market) it is better to have everything controlled as property. Thus, the illusion continues, more control is always better. Furthermore, the illusion states, if you fight against more control, you are against control completely. Lessig pointed out that this is not the case. We have things owned in common (highways were a common example) and things owned privately. Balance must be achieved even in the physical world. Even more so in the digital world. More so because in the digital world resources have little to no possibility of being used up. Thus, we must consider them as separate from physical property. Ownership will not disappear in the digital world, however, it should not be given a priori; its benefits should be demonstrated by those who want to claim it as property. The second issue was in response to the fact that many laws and regulations are being made in relation to the expected consequences of new technologies. However, these things limit the use of new technologies and stifle innovation in favor of existing (usually large) companies. The existing parties that are in favor of these regulations thus shift the burden of proving usefulness onto new technologies. Yet if a technology cannot play around in the real world, how is one to determine whether or not there is a use/market for it? I think this is the book where Lessig truly became one of the most essential public intellectuals of our time. Reading it in 2008, years after its initial release, it has turned out to be stunningly prescient. He writes about the social, economic, and political ramifications of our misguided intellectual property and technology policy with clarity and wit here. This is probably the most essential of Lessig's three books. Code 2.0 can be pedagogic at times and Free Culture is the work of a defeate I think this is the book where Lessig truly became one of the most essential public intellectuals of our time. Reading it in 2008, years after its initial release, it has turned out to be stunningly prescient. He writes about the social, economic, and political ramifications of our misguided intellectual property and technology policy with clarity and wit here. 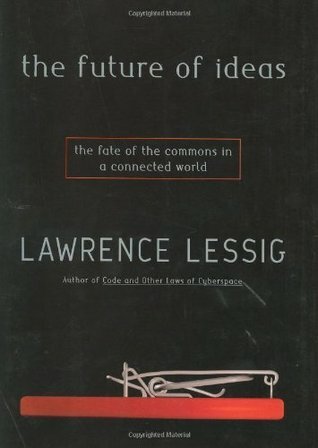 Lessig explores the benefits that the open architecture of the Internet has brought to innovation and creativity. He then turns to the reaction against this architecture by the entrenched stakeholders of the pre-Internet era, such as the music and film industries. His conclusion is pessimistic -- the old is fighting successfully to protect itself against the new and stifling innovation in the process. Still relevant six-seven years on, the book is highly informative and well-constructed. I just had a hard time motivating myself to finish, I don't know if that's because the subject can at times be dry, that the book has been kind of upstaged by Lessig's later efforts, or just my own failings with slightly academic texts. But for those interested in technology, The Future of Ideas is definitely worth checking out for its broad sentiments about the nature of control and innovation. This is probably the most wide-ranging of Lessig's three books that I've read (I'm going backwards, I suppose), which means it's also the least successful (in part because it's the oldest). Still, he as always makes good points. I think Free Culture is probably the best of his books that I've read (still have to get to Code 2.0). Lucid and persuasive, Lessig gives history lessons intertwining commerce, morals, politics and law. We get to understand in lay terms how we got to be where we are in copyright and patent law and why it is important that we're able to build on the assets of others' ideas. Important reading for intellectual property owners and purveyors. I tried. This is a book that's truly written by a lawyer - many hundreds of pages of analogies and examples to prove his point, presented in a very bland way. I read the quarter of the way, but Larry's writing could not hold my attention. He takes a long time to get to this point. His ideas are big and important, just not written in a way that appealing to a lot of people. Lessig's ideas are still valid but I think he greatly underestimated how much people will be drawn to quality ideas. Even though Microsoft and AOL-TW had every competitive advantage, they still blew it by not innovating. Innovation seems to emerge, even in the face of highly controlled systems. I still prefer Lessig's idea of an intellectual commons, though. Copyright and control issues in realms of data networking and broadcasting are compared in detail. The emphasis is on being mindful of software and legal developments that will affect what a U.S. citizen can access in the public domain. Well presented and thorough, the author has presented a compelling argument for limiting copyright and patents. We've forgotten the original reason (to encourage innovation) and shifted to indefinitely protecting existing ideas. It's not a terribly exciting read, but it was interesting. The Future of Ideas, by John Lessig. An eye-opener, and makes me even more opposed to the further cementing of Disney's iconic copyrights. It breaks down who runs the web, how it runs, and the decisions and biases that determine the rules of the internet. Not sure I buy this hook, line and sinker. But it does make you think, and that is what Lessig wants, I am pretty sure. This is a very informative and interesting take on the history and future of ideas on the internet. Not a light read, but then it's not a light subject.